Groundwater is a vital Australian resource and in the drier regions, it is the only water source. Just because it is sealed underground doesn’t mean that it is impervious to pollution and contaminants. If it isn’t caught in time polluted can lead to serious health problems like dysentery, hepatitis, and severe poisoning. It can make the surrounding wildlife sick as toxins integrate into the water supply. In order to raise awareness, we are sharing the common ways in which groundwater gets polluted. At times it’s the naturally occurring conditions that make groundwater unsafe. As water passes through soils and erodes rock, there is a possibility that it will absorb minerals that pollute the water. In Australia, a lot of groundwater has a high concentration of saline that damages plant life. It can have a negative on farming by decreasing plant growth and water quality. Sometimes the garbage we bury can pollute groundwater. Landfills can be a source of groundwater contamination. This happens when there is no protective layer, or that layer is damaged, at the bottom of the landfill. When that happens, things like house cleaning products, battery acid, and paint seep through and taint the groundwater supply. Chemicals sprayed on crops can sink into the earth and end up polluting groundwater. When it rains, things like pesticides and fertilizers will work their way into groundwater over time. Also applying pesticides on a large, like using an airplane, can contaminate local water supplies. 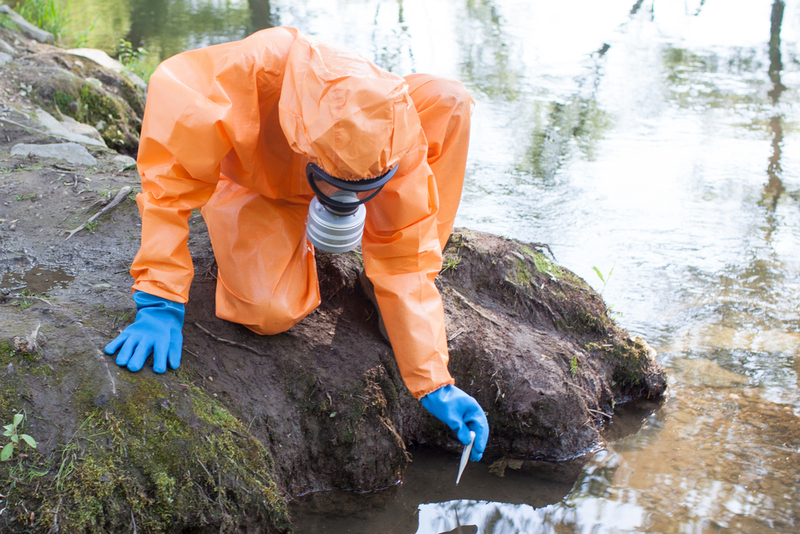 Groundwater pollution can occur when hazardous waste – such as medical waste, chemicals, poisons, anti-freeze, and motor oil – isn’t disposed of the right way. If these contaminants leak then they can eventually make their way down into groundwater. This can happen with mass scale industrial waste or with household products. If you’re disposing of anything dangerous, hazardous or poisonous make sure you are doing it safely. Make sure you abide by local waste disposal guidelines. If sewerage pipes aren’t running the way they should then it can mean our toxic waste finds it’s way into groundwater. If not installed properly or poorly designed it will build up and contaminate rather than washing away waste. The same goes for septic tanks, onsite sewerage systems, any kind of irrigation, and ash ponds. Even a poorly constructed or abandoned well can have a negative impact on the surrounding environment. Eventually, everything returns to the earth. Pollution in the air is carried by rain, or melting snow, and is absorbed into the ground. Groundwater is part of the hydrologic cycle. So, if other parts of the cycle are contaminated, like the air, streams or other bodies of water, then it will carry pollution into groundwater. From there, these toxins can be carried into groundwater. Tanks that hold oil, chemicals or any other contaminant have been known to pollute groundwater. This only happens if the tank leaks or spills. If the tank is buried underground it can spill if the tank erodes or it isn’t installed properly. The main tanks that cause pollution are ones you’d find at a service station or a refinery. So if you any of these products take a moment to look into the correct way of disposing of them. Even if you’ve taken good care of the environment just remember there could be contaminants that still remain from long ago. If there was industry activity on your property then the groundwater could be polluted. Ask yourself when the last time you got your groundwater tested. If you own bore water then it is your responsibility to make sure the supply is safe to use. If you have concerns about groundwater, Alpha Environmental can provide a variety of tests to put your mind at ease. To learn more, or to request a quote please call us on 1300 039 181.